This tutorial shows how PolyCV can be used with Zero Hybrid Synthesizer to create unique sequences. The first section points you to a compatible arpeggiator Rack Extension. The second describes PolyCV. 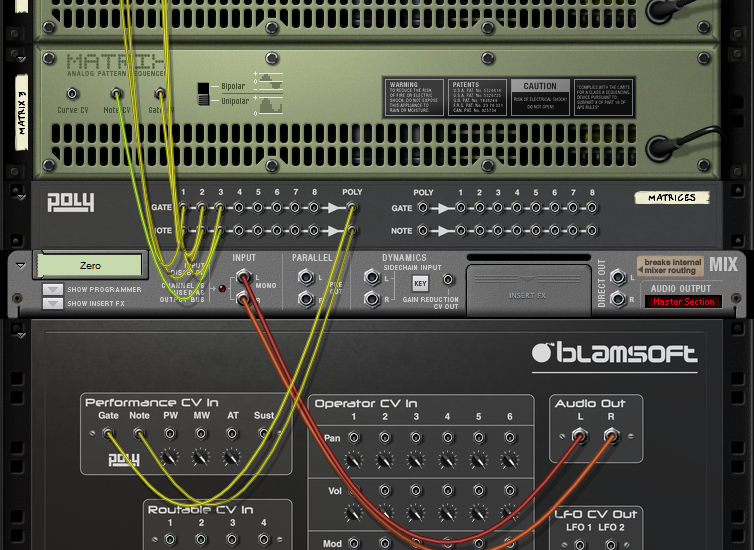 The third section covers using multiple Matrix sequencers to create polyphonic patterns. And the fourth section covers chord generation using stock devices. The easiest way to control Zero with PolyCV is to use Mercury by Quadelectra. 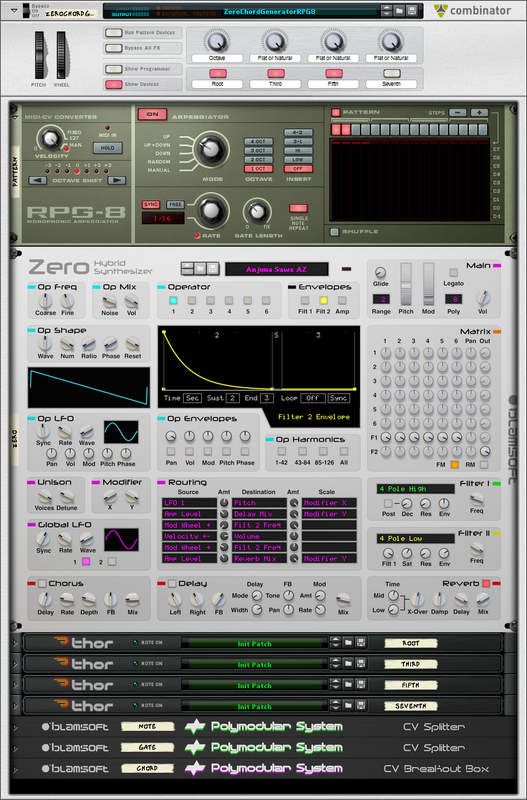 It is a powerful arpeggiator Rack Extension that can be quickly connected to Zero for polyphonic fun. Continue on for other approaches that use stock devices. First, a little background info. PolyCV is a protocol available to Rack Extension developers that allows for communication of polyphonic note messages similar to MIDI. 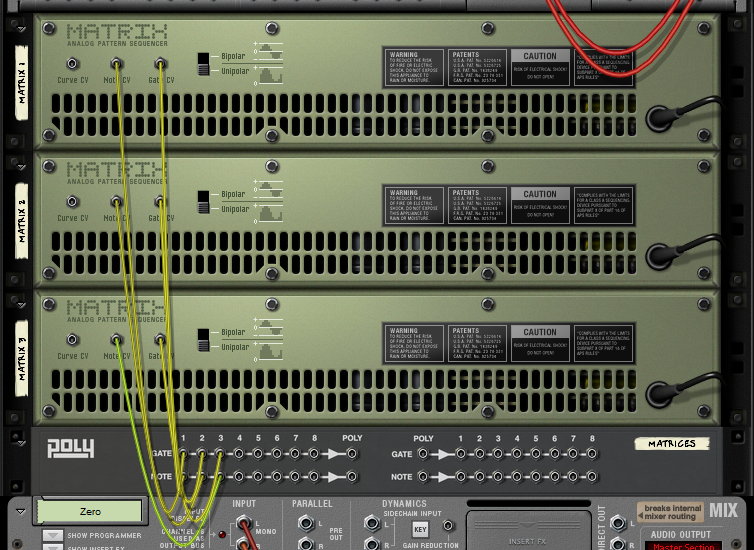 The Polymodular System devices were the first Rack Extensions that could handle multiple Matrix Pattern Sequencers by using this protocol. 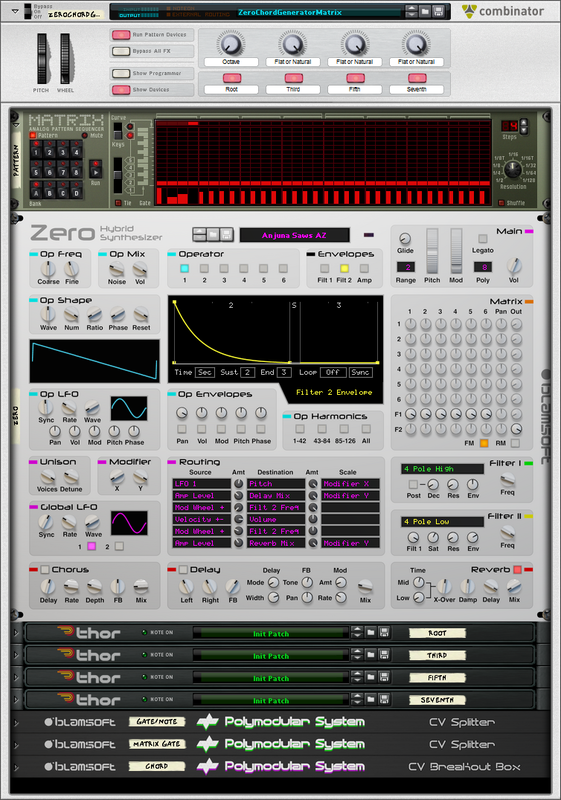 Now Zero Hybrid Synthesizer has this capability as well. You will need the Blamsoft CV Breakout Box RE and CV Splitter that are available for free in the Propellerhead Shop in order to do it. In this section, we will walk through how to set up Zero to play a sequence from three Matrix sequencers. You can follow the steps or just download the song file. Start by creating a Zero synth and choosing your favorite polyphonic patch. In this example, it is Fake Saw NR from Zero’s factory sound library. The key to hooking up the sequencers is to use the CV Breakout Box. Add the Matrix Pattern Sequencers and a CV Breakout Box above the Zero as shown. Now we connect the Matrix devices to the CV Breakout Box. Connect the Gate and Note outputs from each Matrix Pattern Sequencer to an input pair on the CV Breakout Box as shown below. The last step is to connect the CV Breakout Box to Zero. Connect the Poly Gate and Note outputs to Zero’s Gate and Note inputs as shown below. Now the routing is done. The same procedure could be used for other triggering devices such as the RPG-8. Have fun programming the sequencers! Using PolyCV and some help from Thor it is possible to create a chord generator. 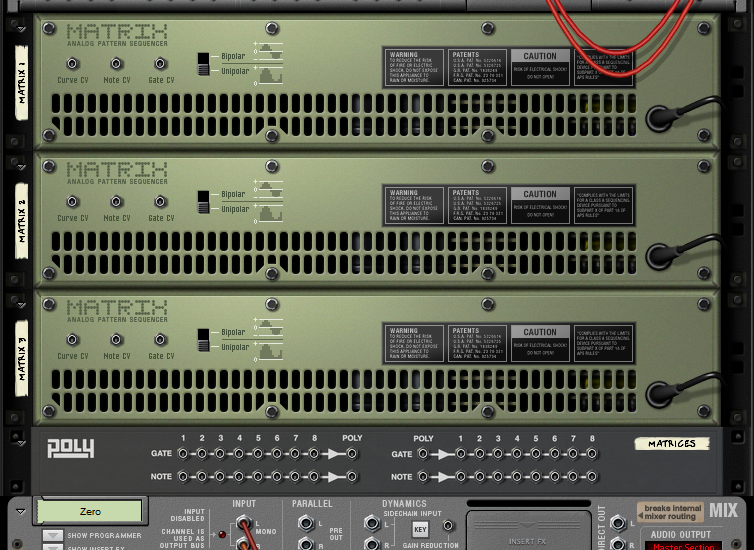 Either RPG-8, Matrix, or Alligator can be used to generate the gate signal while Thor provides transposition of the note signal to the chord tones. The root, third, fifth, and seventh can be enabled/disabled. The root can be transposed down an octave. The third, fifth, and seventh can be flat or natural. The Combinators require a bit of routing so they are provided without detailed explanation. Here is a screen shot of the RPG-8 based chord generator. The gate length can be freely adjusted. The pattern can be quickly set using the buttons. Here is a screen shot of the Matrix based chord generator. It is possible to set a velocity for each step and the length of each step is either half length or tied. With this setup you can have multpile patterns and automate the pattern selection. 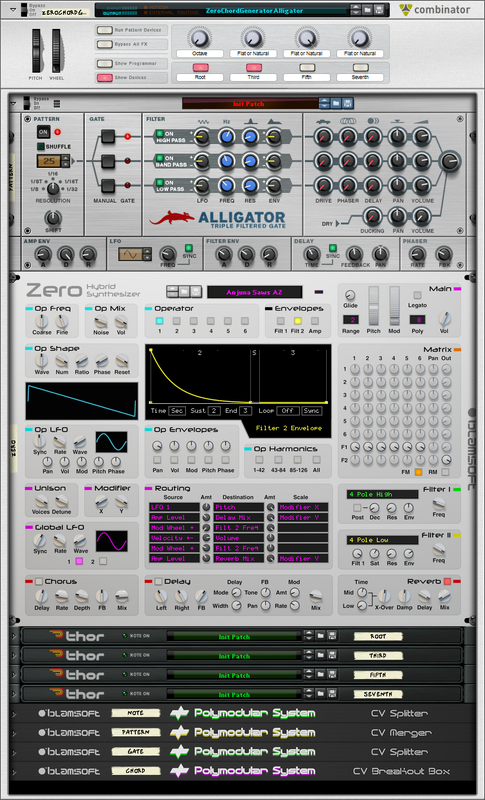 And finally, a chord generator using Alligator. This allows for using the cool built-in preset patterns. You can also automate the pattern number selection. The Thor step sequencer is used to generate the note numbers. You can tweak the first step’s note in each Thor to change the chord further. Have fun making great music with just one finger!